Christmas Bowl resources, including songs, prayers and Advent Candle litanies are now available online. And we are here to worship God. You are the God of Light. You are the God of hope. You are the God of joy. You are the God of love. God of everyone! Thanks be to God! be the love that dwells between us. be the peace that dwells between us. be the joy that dwells between us. and particularly this Advent time. This world is God’s good creation; yet all is not well. We are a broken people. As the year descends into darkness and winter approaches, we feel in our bones the coldness and need of the human family. Evil abounds. Cruelty is policy. Injustice reigns. Racism, greed and sexual violence crowd the news. Hope flickers among dark shadows. 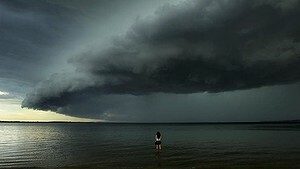 We cry to God with Isaiah, “O, that you would tear open the heavens and come down!” (Isa. 64.1). But in our longing we do not just gaze at the sky. We get ourselves ready. We don’t just wish; we prepare. We trust God is at work in the midst of the mess with a transforming, life-giving power. Like Mary, we say Yes to that power unfolding within and among us. We become the change we want to see in the world. We become people of peace and gentleness, of love and courage. We become candles shining confidently in the darkness. The Advent season is a time not just to ramp up to Christmas, but to open up to God. It’s a time to let God’s light spark in us, to let God’s Presence deepen in us. It’s a time of stillness, a time of prayer, a time of opening. As we wait in the darkness, God’s light dawns in us, and we become people of joy. We are ready for new life. We are ready for Christ to walk into our living rooms. We are ready to bear Christ into the world. We become God’s love, enfleshed, vibrant, and powerful. Though we may fear people’s resistance, we are not the only ones who are crying, “O that you would come!” We bear love and grace and justice into a world that awaits us with hope. Welcome, Advent. In the 6th century, the Celtic Christians celebrated Advent during the 40 days before Christmas, as a mirror to the period of Lent before Easter. In this age of blurring of holy-days and consumerism, starting Advent earlier gives a longer, more intentional preparation for Christ’s coming. Christmas seems to end abruptly on December 26th in our consumer-culture celebration. Another lost tradition marks the Twelve Days from Christmas to Epiphany. Epiphany means appearance or manifestation and remembers the Magi visiting Jesus; Jesus’ baptism in the Jordan–the public revelation that he is God’s Son; and the first miracle at the wedding feast in Cana. The period from December 25 to January 6th is an ideal time for reflecting on the Light that has come into the world with the birth of Christ. A joy spiral for Advent (Christine Sine). Using water as the entry point for the advent themes, especially suitable for the southern hemisphere as summer approaches and for the season of drought in many places. 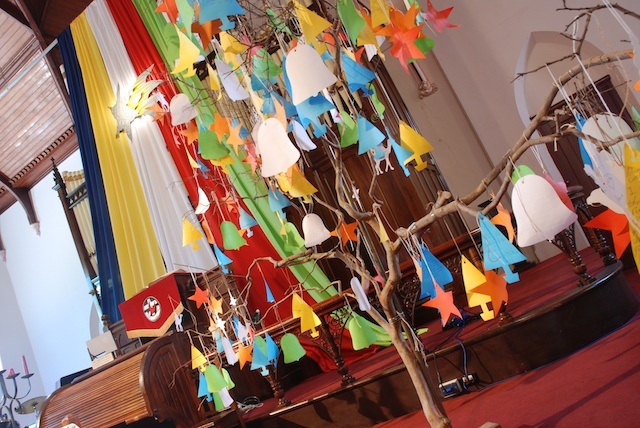 Christmas Bowl Resources, including songs, prayers and Advent Candle litanies here. How do we live in a world that kills unarmed black boys? How do we raise our children in world that sets murderers free? What does our privilege afford us, and what does our privilege call us to do? Cries of silence, cries of pain rise up like incense before the Holy One as we sit, as we wait. From the depths, we cry, and from mercy, God hears the voices of grieving mothers and marginalized prisoners and oppressed captives. From the depths, we cry, and from mercy, God attends our needs for peace, for healing, for justice, for love. From the depths, we cry, and from mercy, we sit together, and we wait. From the depths, we cry, and from mercy, we trust and we live. From the depths, we cry, and from mercy, we sing a new song in spite of our fear. From the depths, we cry, and from mercy a child is born. From the depths, we cry, and from mercy we creatively and powerfully act. If we are to be so bold, someone could actually yell a cry here. It is dramatic, but I think it’s appropriate and adds texture to the true lamentation – or, invite a grieving mother to read this line about Rachel. Here, I would invite people to voice their questions, their cries, their laments. I would place a few in the congregation as “plants” with something already prepared, but invite people to spontaneously speak aloud a one sentence question or cry or lament. what matters to God is simply that you are here. We are entering the time of Advent, in preparation for Christmas. that we need prepare for it. We need to make the space in our lives where love might be born. Welcome to this tiny corner of a harsh and dark world. ‘Through darkness, we begin to see the world and sense God’s presence around us in new ways, guiding us through things seen and unseen, and teaching us to find our footing in times of uncertainty. Like seeds buried in the ground, we will find how darkness is essential for our own growth and flourishing’. ‘I have learned things in the dark that I could never have learned in the light, things that have saved my life over and over again, so that there is really only one logical conclusion. I need darkness as much as I need light. Recognising our tendency to associate all that is good with light, and all that is evil and dangerous with darkness, BBT asks whether God doesn’t work at night too? In Advent, themes of light and dark are explored, often with light trumping the darkness. But maybe this duality is unhelpful. At Pilgrim, we are doing a study of BBT’s book as our Advent study this year. The wonderful Helen Wiltshire has penned some Advent introductions for our services in 2014 which will deliberately juxtapose hope with its opposite, love with its opposite etc and thereby explore the dark shadows, and discover God is in the darkness too. “If you decide to say no, you simply drop your eyes and refuse to look up until you know the angel has left the room and you are alone again. Then you smooth your hair and go back to your spinning or your reading or whatever it is that is most familiar to you and pretend that nothing has happened…. Or you can set your book down and listen to a strange creature’s strange idea. You can decide to take part in a plan you did not choose, doing things you do not know how to do for reasons you do not entirely understand. You can take part in a thrilling and dangerous scheme with no script and no guarantees. You can agree to smuggle God into the world inside your own body. “The gospel ought to consume us; instead we have turned it into a consumable. I believe the good news about the reign of Christ over the all creation, the invitation to love our enemies, the vision of communities beating their weapons into agricultural implements, has been turned into a product. For many the gospel has been reduced to a privatized salvific experience purchased through a ministry outlet mall – the church dressed up like a coffee shop selling cups of Pumpkin Spice Saviour. When the gospel is reduced to a highly individualized and highly privatized experience, we lose the larger picture of God’s plan to make all things new. We see our part in God’s mission exclusively through the lens of producing a convert, not restoring the cosmos. If the gospel were only about words, then I suppose it could be wrapped in packaging and sold at gospel outlet malls. But its nature is cosmic and its purveyors are organic. It defies the easy reduction to a sales pitch. If the mission of God is the renewal and reconciliation of all things – people, planet, and powers – then the people of God need to be about the activities of God”. Life involves a lot of waiting, both ways. Waiting in the check-out. Waiting in the doctor’s office. Waiting for the traffic light to change. Waiting for test results. Waiting for nine months for birth. Parents waiting for children to grow up and act more mature. Teachers waiting for students to finally grasp a concept. Waiting for those we love to be touched and transformed by that love. At this time of year, we‘re especially reminded of it. Christmas involves a season of waiting. We hear talk about waiting for a saviour to come and free us from whatever is holding us back. Waiting for God to intervene and take our lives in a different direction. Waiting for dawn to arrive and end the long and lonely night we often feel in the pit of our soul. When will the waiting end? Unfortunately, religious practices can degenerate into nothing more than waiting. We wait for God to respond to a prayer and make things go the way we want. We wait for God to right a wrong. Wait for God to set things straight. Wait for God to change the world. Change our lives. Please! But wait! What if we‘ve got it backward? To revisit that waiting-goes-both-ways thing: Instead of us waiting on God, what if God is waiting on us? You want the world to be a better place? Do something to make it so. And it doesn’t have to be a spectacularly grand act. Something little is fine — God works through the little things. But what’s important is to live each moment in this spirit. This moment is a gift. If all we do is sit and wait for things to change, then we’re like people trapped in a perpetual state of Advent. We never get to our own Christmas morning. We do nothing more than wait. 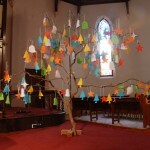 Link to many prayers written by John Birch for Advent here. His website has a plethora of prayer resources! (He also has a Facebook page where resources are posted). God is at work in the world, renewing, remaking, resurrecting, bringing hope through the faith, the gifts, and the work of the church. We trust in God, and together we work for peace and justice through God’s Spirit. Let us rejoice in our God-given opportunity to share in God’s work. The offering is collected. Thank you, God of Love, for the promise of this season. We are grateful for the generosity aroused in us by Christ’s coming into the world. May these gifts represent a new spirit of joyous sharing among us, for the sake of all your children everywhere. Amen. You, child of God, will be transparent to divine presence. You will open doors for people into the Holy. 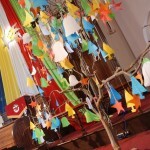 Prayer Tree during Advent 2007 at Spicer uniting Church St Peters South Australia. 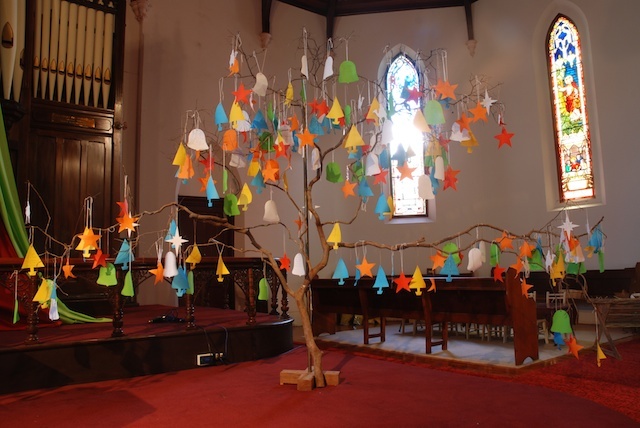 Each week over the Advent season people wrote their prayers onto shapes that were added to the tree. Each week a different focus for the prayer & a different shape and colour. Each week the tree grew in its fullness and richness. We come, O God, with adoration and praise, as well as thanksgiving, to you. Our anticipation grows as we begin the journey to the day of great celebration of the birth of your Christ. Open our hearts that we may truly receive the gift of your Son, and know that the joy of life is found with you. Amen. Inspire comes from the Latin word meaning to breathe in. Too much religion is ‘out-breathing’ or talking at God or just talking God at other people. It isn’t a wonder then, that religion is often uninspiring for many people, (and sometimes often also for many who practice it – not that some are often honest enough to admit it). Too often religious practice has little to do with listening to God or listening for God. To listen for God or to God is an act of faith. To listen for God is also often a great risk, because we might hear God, and that is usually profoundly disturbing. It is not only disturbing because it is not what we are expecting, but usually because God calls us beyond ourselves into loving service of others which requires us to move beyond our comfort zones and enter into applied grace and compassion. Now is the time, let us pause. As we wait, may we hear the voice of God. Now is the time, let us watch. –may we see the face of Christ. Now is the moment, let us prepare our hearts. –may God’s extravagant love shine through. God beyond time and space, take this moment of worship and bless it. May the grace experienced in this place be multiplied to overflowing so that your whole world sees the light of your love. God of new surprises, take each of us here and bless us. Create in us clean hearts, refresh our spirits, and transform our whole beings, until we reflect your love and compassion through and through. In the name of Emmanuel, God with Us, the one who comes to us even now, Amen. Compilation of resources for Advent 1C by Christine Longhurst (definitely recommend checking out her blog for more resources). and three wise men set off into the night to follow a star and look for a child. to prepare for our annual pilgrimage through Advent to Christmas. So as we set our feet on the journey we light a candle to honour their stories, and to guide us along the path of our heart’s deepest longings. And when we open our newspapers the hollow promises of our political leaders seek to persuade us that if we vote for them all our troubles will be over, and a new era of justice and mercy will prevail. Even our own promises ring hollow in our ears, promises we make at the turning of the year, or in our prayers, or to our family and friends: all the good things we say we want to do, but then, amidst the pressure, allow to slide away. or to try to appear better than we are, we turn to you, God of life, and remember your promises, and place our hope and faith in you. Amen. do not let my enemies exult over me. Do not let those who wait for you be put to shame. Make me to know your ways, O Lord; teach me your paths. Lead me in your truth and teach me, for you are the God of my salvation for you I wait all day long. Complex paths and choices lie open before me! I am constantly diverted and distracted. Help me in all the small daily decisions to be flowing with the Spirit that shapes my life. Be mindful of your mercy, O Lord, and of your steadfast love for they have been from of old. Do not remember the sins of my youth. or my transgressions. According to your steadfast love, remember me, for your goodness’ sake, O Lord! There are many things in my life I regret, and sometimes memories of the past prevent me living fully in the present. But when you, God of my life, look at me, you see my potential for goodness, and forget the past. So I will hold the knowledge of your grace before me, and go confidently into this new day, and the days ahead. Refining God, it is not easy for us to admit we are not a blameless people. We have trouble believing the promises you have made. We find ourselves captive to emotions and lusts which stun us, but doubt you can save us. We prefer the shadowy streets of the world, rather than walking in your Light. may the Life of Christ be our model as we seek to be your people. Do you feel it? God’s tender mercy rests on you, heals you, transforms you. Do you see it? God’s Light breaks into our lives, and shows us the way. Renewed and made whole, we see the path God has prepared for us— the way of peace, the way of hope, the way of grace, the way of service. Thanks be to God. Amen. and arrogant rich are turned away. Instill in us unthinkable marvels. We light this candle because we need the rumour of hope. We gather as those who carry the rumour of peace and the truth of love into a world longing for light. We gather as those who pray for the justice another is waiting for, who speak of the hope another needs to breathe. Eternal God, you are love, love made clear in the life of Jesus. Come near loving God, come very near. There is space in my life, Lord. There is room in my heart, Lord. Please fill it with your compassion. There is an expanse in my mind, Lord. Expand your Kingdom throughout it. There is an emptiness in my soul, Lord. Pour in your meaning and fulfillment. There is space in my life, Lord, if l just can clear out the mess and clutter of my material existence. Come Lord, dwell within me. Occupy my living with your loving purpose.